Q: If I don't do construction, how can I help? A: Yes. 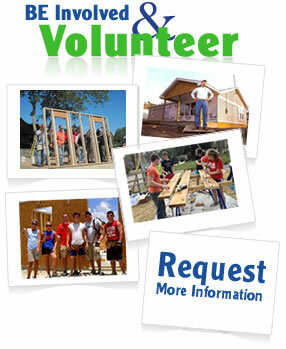 For more information visit the volunteering page. Q: I'm not low-income, can I still buy stuff at the Habitat ReStore? 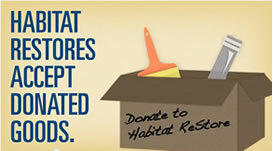 A: Yes, the Habitat ReStore is open to the public. Q: What is the Charity Code Number for the Combined Federal Campaign? A: The new 5-digit code number for Habitat for Humanity of Roosevelt and Curry Counties is 98255. Q: Can I make a donation using a credit card? A: Yes, you can, and there are two ways to do so. You'll find both methods, and few others on our donations page. Q: Who can get a home? A: Partners for homes are selected from applicants by our Family Selection Committee. Income and family size are some of the criteria used, but are not the only ones. In general, acceptable applicants will be lower-income families that don't necessarily have established credit, but don't have BAD credit. A: No. Some people have the misconception that Habitat gives away the homes that are built, but that is not true. The homes are SOLD to the family with a zero-interest mortgage, a way that makes the monthly payments affordable. A: The overall cost of the home is kept low by using donated materials, volunteer labor, donated land (when available), and by using a simple design. The sale to the family is financed with a 30-year no-interest loan based only on the cost of materials or land purchased to build the home. In general, the monthly loan (plus escrow for property taxes and insurance) payments are about the same the family would have to pay for rent of a comparably sized home (probably not in as good a condition). Loan qualification does not usually require established credit, but the family cannot be in a BAD credit situation. A down-payment of $100 is required at the time that the contract is signed, and closing costs of no more than $500 will be required at the closing of the loan for the home. A: You must fill out the application and submit it to us. For more information go to Applyng for a Home.